The Char Custom Zaku I piloted by Char Aznable during the Battle of Mare Smythii is now available as a model kit! The Mobile Suit's backpack uses new molding to fit Char's Custom Zaku I, and you can recreate the markings on every part of the MS using the included tetron stickers. 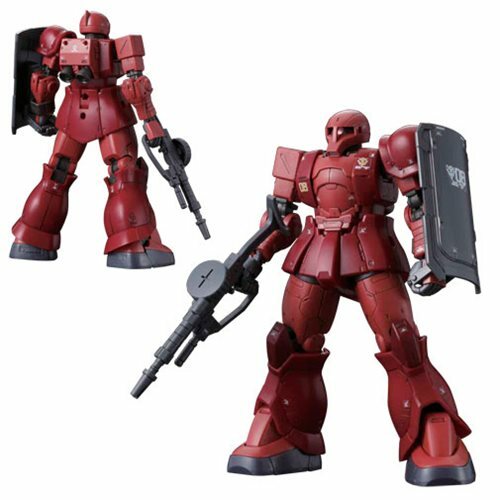 All weapons used in the anime, such as two types of Heat Hawk (sheathed and unsheathed), are included in this 5-inch tall Gundam: The Origin MS-05 Zaku I 1:144 Scale Model Kit. The Gundam: The Origin MS-05 Zaku I 1:144 Scale Model Kit includes an MS machine gun, a shield, a heat hawk (unsheathed), a heat hawk (sheathed), a gun-wielding hand (right), weapon-wielding hands (clenched) (left and right), an open hand (left), 11 runners, a tetron sticker, and an instruction manual.